Investigation: How Does Exercise Affect Heart Rate? 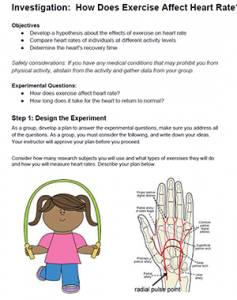 This activity was designed for anatomy and physiology students who are studying how feedback loops work and also serves as a refresher on the scientific method and designing experiments (science and engineering practices). Students work in groups to develop a hypothesis about how exercise affects the heart rate. This is fairly obvious for most students in my age group, but the next question asks them to determine the recovery time and compare how recovery times differ for individuals. The group is responsible for designing the experiment, so they must determine how many individuals they will test, what type of exercise will be done and how they will measure heart rate, though a diagram is provided to give them a clue to measure using pulse rate. During this phase of the activity, I circulate among groups and help them with the details of their plan. The final analysis uses a CER format where students make a CLAIM that answers the experimental questions, and then provide a summary of their evidence. Finally students discuss reasons for their observations by linking the results to their understanding of the physiology of the heart. I often do this activity at the beginning of the year, but it could also be included in the chapter on the circulatory system. It’s also possible, if you are short on time, to do an abbreviated version of this activity where you give students more direct instruction on how to take their pulse and have them do some light activity and just compare their own rate increase and recovery time.